Situated in the heart of Dorset s beautiful landscape of rolling hills and open farmland affording wonderful walking there are a network of footpaths directly from the property. The area offers a wealth of pretty villages sandy beaches and a coastline which has world heritage status. The pretty market town of Shaftesbury which itself is home to Gold Hill known to many as Hovis Hill as it was used in the 70 s television adverts for Hovis bread is 5 minutes away. The popular seaside resorts of Poole Bournemouth and Weymouth are worth a visit. Other attractions include Hayes Motor Museum Longleat House and Safari Park the beautiful gardens at Stourhead House Salisbury Cathedral Yeovilton Air Arm Museum and Monkey World. Entering the property from the enclosed terrace you are met by a beautiful lounge/kitchen/diner with an impressive apex ceiling exposed beams sliding doors and oak flooring. 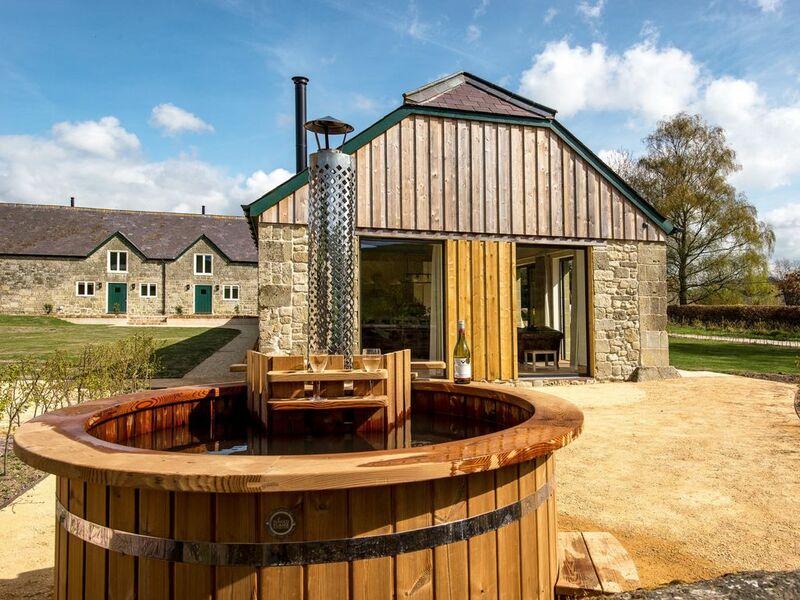 Here you can relax and enjoy the countryside views while snuggled up in front the wood burner. Enjoy watching your favourite programme on the Smart TV or take time to enjoy a DVD. The impressive kitchen is very well equipped and is perfect to try out some new recipes or cook some old family favourites using the breakfast bar/island. The kitchen has an electric oven and hob Lavassa coffee machine microwave fridge with ice compartment and dishwasher. The utility room has a fridge/freezer washing machine and plenty of space for storing muddy boots. Leading from there are the ground floor bedrooms starting with the king-size with TV and beautiful views the second super king-size zip-and-link (which can be made into a twin on request at time of booking) has a dressing room TV and en-suite bathroom with hand held shower over bath and WC. You will then come to the third bedroom a cosy twin with TV a great room for children. There is also a wet room with shower and WC conveniently located on this floor too. Heading upstairs you will find a king-size bedroom with TV. All four bedrooms are beautifully furnished and all king-size rooms boast countryside views. Venturing outside you will find a private enclosed terrace directly outside the lounge/kitchen/diner doors perfect for outside dining with garden furniture BBQ and a wonderful wood fired hot tub. There are large shared gardens all enjoying the fabulous countryside views. Have fun in the shared open sided games barn with table tennis and table football. Ample off-road parking is available in the gravelled parking area. Pratically perfect in every way!